This article is about Ivysaur's appearance in Super Smash Bros. Ultimate. For other uses, see Ivysaur. Also, for information about Ivysaur in regards to Pokémon Trainer, see Pokémon Trainer (SSBU), Squirtle (SSBU), and Charizard (SSBU). Ivysaur is a playable character in Super Smash Bros. Ultimate. It was confirmed on June 12th, 2018. Along with the Pokémon Trainer, Ivysaur is classified as fighter #34. Ivysaur's English and Japanese voices are now provided by Justin Anselmi and Inuko Inuyama, its current voice actors as of Pokémon the Series: XY. Ivysaur was previously considered the worst Pokémon in the Pokemon Trainer's party and one of the worst characters in Brawl (especially if judged as a standalone fighter), due to its large amount of significant weaknesses, namely short range on its attacks, notable KO problems due to laggy finishers, bad aerial game, terrible recovery and one of the worst special movesets in the game. Likely as a result of this, Ivysaur has been heavily buffed in its transition to Ultimate. Ivysaur's biggest buffs come from the adjustments to the Pokémon Trainer's mechanics alongside universal gameplay changes. The type effectiveness mechanic (which previously gave Ivysaur a disproportionate weakness to the common flame-type attacks throughout the cast) has been removed, while the elimination of stamina allows Ivysaur to stay in the fight without weakening its moves. The removal of edgehogging, the introduction of ledge trumping, and the various changes to tether recoveries have substantially toned down a critical weakness in Ivysaur's recovery, due to its reliance on one. Ivysaur's air speed is also much higher and it can switch to Charizard at any time in the air to return to the stage. The changes to SDI also heavily benefits Ivysaur's multi hit moves as they are more reliable than previously. Ivysaur's entire moveset has also been modified and is significantly more useful overall. The addition of a finisher and the changes to neutral infinites makes its neutral attack more consistent, while down tilt now consists of only one hit that semi-spikes. Some of Ivysaur's notoriously weak attacks, such as down smash and back aerial, have had their power increased, with down smash now having a sweetspot that can KO at realistic percents. Ivysaur's entire aerial game has received several improvements: it has a new, disjointed neutral aerial that performs much better than its old one, previously a situational move that was easy to escape. Up and down aerials' momentum changes are less extreme, and down aerial's infamously weak and hard-to-sweetspot meteor smash has been buffed significantly, losing its sourspot and now functioning as a powerful edgeguarding tool, while the changes to grounded meteor smashes grant it extremely rewarding setups at a wide percent range, including into up smash. In addition, Ivysaur's throw game has been heavily improved as it now has a KO throw in the form of back throw, alongside increased followups from up throw and down throw due to the changes to hitstun canceling. Lastly, its entire special moveset has been improved: Bullet Seed now has a finisher, Razor Leaf's infamously unreliable trajectory is now more consistent, which makes it a noticeably better projectile, and Vine Whip no longer causes helplessness, which grants Ivysaur a new offstage attack and combo finisher. However, Ivysaur still retains many key flaws from Brawl. Many of Ivysaur's weakest attacks are still ineffective for KOing despite their buffs, while some (such as forward and back aerials) send at a diagonal trajectory that make them mediocre for edgeguarding. It has also received a few nerfs: Bullet Seed has had its maximum damage output significantly reduced, and Vine Whip has lost its grounded hitbox that leads into the vine. Ivysaur is still one of the few characters entirely dependent on a tether recovery, giving it notable problems offstage, which is further harmed by tethers no longer being usable out of an air dodge. Some of Ivysaur's stronger kill moves such as up smash, forward aerial and up aerial are weaker and finally, the reduction to Ivysaur's weight and the removal of momentum canceling hinders its survivability. Regardless of its nerfs, Ivysaur has improved dramatically since its introduction in Brawl, especially in relation to the rest of the cast, and is generally agreed upon to now be the Pokémon Trainer's best Pokémon, as opposed to the worst as in Brawl. It now performs more effectively as a character in the Pokémon Trainer's party, fulfilling the role of the "zoning" fighter with disjointed range on its attacks, a conventional projectile, and setups into its powerful bud-based moves. Ivysaur's design and proportions have changed. Its flower bud now has multiple layers of petals and a smoother texture. Its pupils and ears are slightly larger, and its toes are much less pronounced. It patches have also been re-positioned. It is more vibrantly colored overall, with its skin being a lighter shade of blue and its flower bud being a lighter shade of pink with its leaves being a lighter shade of green. In addition, Ivysaur's teeth and toes are white instead of beige. Due to these changes, it now matches match its appearance in more recent Pokémon games. Ivysaur is much more expressive than it was in Brawl. Ivysaur always faces the screen regardless of which direction it turns, causing all of its animations to be mirrored. 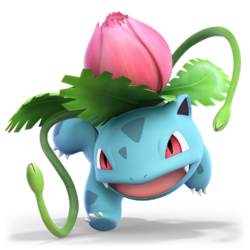 Opponents now grab Ivysaur by its body, instead of its flower bud. Ivysaur has a new victory animation, where it performs Vine Whip in front of itself a couple of times. This replaces the victory pose where it walks in place a few times. The victory pose where Ivysaur backflips now has it land upright, as opposed to landing on its belly. Like all characters, Ivysaur's jumpsquat animation now takes 3 frames to complete (down from 5). Ivysaur walks faster (1.05 → 1.1103). Ivysaur dashes faster (1.5 → 1.595). Ivysaur's air speed is much faster (0.752 → 0.998). Ivysaur's crawling speed is slower. Ivysaur's fall speed is slightly higher (1.35 → 1.38). Ivysaur's gravity is higher (0.07 → 0.82). Ivysaur weighs less (100 → 96), reducing its survivability. While this would reduce its susceptibility to combos, a combination of its higher fall speed/gravity and the removal of hitstun canceling make it more vulnerable to combos than in Brawl. The removal of type effectiveness benefits Ivysaur significantly more than Squirtle as it improves Ivysaur's endurance against flame attacks, as it was previously notoriously vulnerable to them. However, this also hinders Ivysaur's endurance against water based attacks (which are slightly more prevalent than in Brawl) and it reduces the KO potential of Ivysaur's grass attacks against Squirtle. The removal of edgehogging improves Ivysaur's tether-dependent recovery. The removal of meteor canceling both helps and hinders Ivysaur. While it improves the reliability of its newly improved down aerial, it also makes Ivysaur significantly more vulnerable to meteor smashes as it previously had one of the most lenient meteor cancel windows in Brawl. Forward roll has less ending lag (frame 33 → 31). Rolls have a shorter duration (frames 4-19 → 4-15) and back roll has more ending lag (frame 33 → 36). Air dodge has less startup lag with a longer duration (frames 4-29 → 3-29). Air dodge has more ending lag (frame 40 → 56). Spotdodge has more startup lag with a shorter duration (frames 2-20 → 3-17) and ending lag if it is not cancelled with an attack (frame 26 → 27). Neutral attack's neutral infinite now has a finishing hit: a double vine slap. This makes it less punishable. The first two hits can now also lock opponents due to their altered angles (30° (hit 1), 85° (hit 2) → 361°/180° (both)) and the second hit has less startup lag (frame 7 → 5). The infinite can now be used manually by inputting the attack button a third time instead of automatically transitioning after the second hit. The infinite is also more difficult to escape due to the weakening of SDI. The first hit deals less damage (3% → 2%) and has a shorter duration (frames 7-9 → 7-8). Forward tilt has increased range and connects more reliably. Forward tilt has more startup lag (frame 6 → 10), ending lag (frame 42 → 46) and deals less damage (14% → 11%). Up tilt has less startup (frame 9 → 7) and ending lag (frame 35 → 33). Up tilt has less horizontal range and deals less knockback (50/60 (base), 100/90 (scaling) → 85/61). Down tilt hits once instead of twice. Down tilt has less ending lag (frame 38 → 32). Down tilt deals less damage (2% (hit 1), 5% (hit 2) → 5.5%) and knockback (60 (base), 100 (scaling) → 50/65). Dash attack has a new animation, with Ivysaur performing a shoulder charge/headbutt. Dash attack has a shorter duration (frames 4-20 → 4-19) and the clean hit has reduced knockback scaling (70 → 57) hindering its KO potential. Forward smash has less startup lag with a longer duration (frames 17-19 → 15-20). Forward smash now has a sourspot towards the end of the move that deals slightly less damage (14%). The sweetspot also deals less knockback (20 (base), 99 (scaling) → 45/78) and can also no longer lock or trip opponents at lower percents due to its higher base knockback. Up smash has a new animation where Ivysaur jumps up before the move comes out. Up smash has a larger hitbox (11u → 13u). Up smash has reduced knockback (80 (base), 90 (scaling) → 78/78) no longer being the strongest in the game. Down smash can deal more damage, with the damage being greater towards the tips of the vines (8% → 12% (far)/10% (mid)/8% (near)). The sweetspots are semi-spikes (361° → 34°/30°) which deal more knockback (40 (base), 80 (scaling) → (45/84)/(50/77)). The near hit of the attack has identical damage and knockback to its former counterpart. Down smash has increased range. It also has less startup (frame 16 → 13) and ending lag (frame 64 → 46). Neutral aerial has a new animation: Ivysaur points its bud towards the screen and spins its leaves, hitting 8 times. Neutral aerial deals less damage overall (2% (hits 1-7) → 1% (hits 1-7), 2% (final hit)). Neutral aerial has increased range, and its hitboxes are disjointed. The final hit has altered knockback (10 (base), 220 (scaling) → 30/200). Neutral aerial has more startup lag (frame 4 → 7), landing lag (11 frames → 16) and auto-cancels later (frame 35 → 41) no longer doing so in a short hop. The final hit can also no longer lock opponents. Forward aerial no longer has a sourspot, consistently dealing 12% damage. It also has less startup lag (frame 15 → 14), ending lag (frame 51 → 49) and landing lag (28 frames → 13). Forward aerial deals less knockback (35 (base), 103 (scaling) → (51/81/81/90)/(76/46/46/45). Back aerial's second hit no longer has a sourspot. Back aerial deals more damage (2% → 3% (hit 1), 2%/3% → 6% (hit 2)) although the knockback on the second hit was compensated (10 (base), 160/170 (scaling) → 25/110). It also has less ending lag (frame 46 → 44) and landing lag (10 frames → 7). Back aerial's first hit has more startup lag (frame 4 → 7) and has increased knockback scaling (20 → 27). Back aerial can also no longer auto-cancel in a short hop due to Ivysaur's faster falling speed. Both hits of back aerial have slightly less range. Up aerial no longer causes Ivysaur to fast fall, instead just giving it a moderate amount of downwards momentum. This makes it easier to use as a conventional aerial attack and less risky to use offstage. Ivysaur can still fast fall manually when using up aerial, allowing it to mix up its positioning when using the move. Up aerial has less landing lag (22 frames → 11). This change when combined with the removal of hitstun canceling grants it much more juggling potential on stages such as Battlefield. Up aerial has altered knockback (32 (base), 97 (scaling) → 64/72). Up aerial deals slightly less damage (16% → 15%) hindering its KO potential slightly, though it is still one of the strongest up aerials in the game. Down aerial's sourspot angle has changed (50 → 270), now being the same as the sweetspot. This means that all hits of the move meteor smash. Down aerial's sweetspot is much larger (2.2u → 7u), improving the ability to hit with the sweetspot. Down aerial's sweetspot deals more damage (8% → 10%), dealing as much as the sourspot. Down aerial's knockback has been altered (20 (base), 80 (scaling) (clean), 32/92 (sour) → (27/17/9/9)/(80/62/98/68). Down aerial has less landing lag (28 frames → 13). Down aerial no longer halts Ivysaur's horizontal momentum as much as before. Due to the removal of hitstun canceling, down aerial's strong meteor smash capabilities can be used to set up tech traps against opponents who are launched off the ground, granting it newfound combo potential. The sourspot has also gained the ability to lock opponents. The removal of meteor canceling also improves the move's reliability off stage. Standing and dash grabs have less ending lag (frame 51 → 42 (standing), frame 50 → 49 (dash). Pivot grab has more ending lag (frame 37 → 45). Pummel deals less damage (3% → 1.3%). Forward throw deals more damage (8% → 10%). Forward throw now consists of a hit and then a throw (8% → 5% (hit), 5% (throw)) although the knockback on the throw was compensated (60 (base), 55 (scaling) → 80/60). Back throw deals more damage (10% → 12%). Up throw deals less damage (10% → 4% (hit), 5% (throw), 9% (total)) and the knockback on the throw wasn't compensated enough (70 (base), 72 (scaling) → 75/95), hindering its KO potential. Down throw has altered knockback (83 (base), 50 (scaling) → 44/122) improving its combo potential at lower percents and improving its KO potential at higher percents. Down throw deals less damage (10% → 7%) and its altered knockback hinders its followup potential at higher percents. Floor attacks deal more damage (6% → 7%). Edge attack deals more damage than the previous fast edge attack, but less than the previous slow edge attack (8%/6% (fast), 10% (slow) → 9%). Bullet Seed's maximum duration is reduced (5 seconds → 2 seconds). It also has more startup lag (frame 4 → 7). Bullet Seed's maximum potential damage is reduced (~60% → ~20%). Bullet Seed now has a finishing hit, making it less punishable. It also has less ending lag (frame 86 → 80). Bullet Seed's seeds are larger but less numerous. Razor Leaf travels faster. It also has less ending lag (frame 51 → 47). Razor Leaf's tap input variant travels further. Razor Leaf's random trajectory has been made significantly less variable, greatly improving its consistency. Vine Whip no longer causes helplessness in the air, and it can be used repeatedly. Vine Whip can now be angled, allowing the attack's reach to be more vertical or more horizontal. Vine Whip on the ground consistently deals 11% damage for non-sweetspot hits, matching the aerial version. Previously, it had various lower damage amounts for different parts of the vine. It also has less startup lag (frame 21 → 15). Vine Whip is less reliable as a tether recovery when used close to the ledge resulting in Ivysaur missing the ledge more often when trying to use Vine Whip. Vine Whip on the ground no longer has a hitbox directly in front of Ivysaur. It also has a shorter duration (frames 21-25 → 15-17). Vine Whip can no longer be performed out of an air dodge. Pokémon Change is much faster due to no longer having to load the next Pokémon during every switch, and it can now be used in the air. Like in Brawl, it also offers brief invincibility upon switching out, though the quicker switch time allows it to potentially combo into another Pokémon's moves, or function somewhat as an alternative "air dodge". It also allows the user to choose the recovery that suits a situation best. Spamming Pokémon Change will grant no invincibility frames for a period of time, and has a cooldown of around 2 seconds. This cooldown can be skipped if a special move is used. Additionally, Pokémon Change no longer resets stale move negation, and if it is performed off the edge of a moving platform, it will no longer skip the ending lag of the switch. Pokémon Change will refresh ledge invincibility if used in the air. This even works if the move is spammed, as the new Pokémon is considered a different character grabbing the ledge. This gives Pokémon Trainer a unique stall option. Pokemon Trainer's Final Smash, Triple Finish, has a different textbox that closely resembles the aesthetics of the Generation VII Pokémon games. Ivysaur's attack, Solar Beam, has updated graphics. Razor Leaf deals less shield damage. 2% Ivysaur whips a vine, then another if the button is pressed again. If the button is pressed repeatedly or if the first two hits connects, it then begins a series of rapid vine slaps, with a finishing hit at the end. The first two hits can jab reset. 1.5% (hits 1-6), 2% (hit 7) Ivysaur leans forward and spins the leaves around its bulb like a helicopter blade, hitting multiple times. Has decent range in front of Ivysaur, but contrary to its looks, the move cannot hit behind Ivysaur. Has a slight amount of startup. Hits 7 times, with the last hit dealing decent horizontal knockback, though with low knockback growth. Ivysaur's only tilt with KO potential, though it KOs very late at around 185% from the edge of Final Destination. 7% Ivysaur pushes its vines against the ground to propel itself upwards. Decent upwards knockback and good upwards range, but it lacks hitboxes beside Ivysaur, making it difficult to hit grounded opponents. Can lead into aerials at low percents. Due to it lifting Ivysaur's hurtbox upwards, it can dodge certain ground-level attacks. 5.5% Ivysaur whips a vine quickly along the ground in front of it. Very fast, can hit opponents hanging on ledges, and deals semi-spike knockback of mild strength, but deals very low damage while lacking followup options due to its ending lag. Useful as a poking option, or as an approach option out of a dash. 12% (clean), 10% (late) Ivysaur leaps forward in a sliding tackle. Fast startup with decent base knockback, which sends opponents diagonally upwards; however, it has significant difficulty KOing due to its angle and low knockback growth, only doing so around 185% from the edge of Final Destination. The late hit of the move deals much less knockback, but at the same angle. 16% (clean), 14% (late) Ivysaur plants its vines on the ground and launches its body forward in a tackle before landing where it started. The move can be angled up or down, though its power does not change. Deals good knockback, is rather fast, and has deceptively good range, although it shifts Ivysaur's hurtbox forward and has noticeable ending lag. The earliest hit deals the most knockback and damage, and can KO at 85% from the edge of Final Destination. Exploding Flower 17% Ivysaur looks upward and, after a brief pause, launches a burst of spores from its bulb above itself. A very powerful move that deals vertical knockback. It is Ivysaur's most damaging regular attack and one of the strongest up smashes in the game, but it has extremely high startup and ending lag, making it suited for hard punishes. Additionally, while it has a large hitbox, it lacks in horizontal range. KOs at 83% on Final Destination. 12% (far), 10% (mid), 8% (near) Ivysaur quickly whips two vines across the ground simultaneously, one in front of it and one behind. Ivysaur's fastest smash attack both in terms of startup and endlag, making it rather safe. However, it deals relatively low knockback and damage for an attack of its kind. The tips of Ivysaur's vines deal the most knockback and damage, and they can hit opponents hanging on ledges. The sweetspot KOs at 105% from the edge of Final Destination. 1% (hits 1-7), 2% (hit 8) Ivysaur spins with its bud facing towards the screen, hitting with its leaves. The leaf hitboxes are disjointed. Hits 8 times, with the last hit dealing moderate knockback. Due to its speed, duration and coverage, it is a good move for aerial contesting or approaching. It has noticeable landing lag and cannot autocancel from a short hop, but has deceptively low ending lag, allowing Ivysaur to use another aerial before landing when done from a full hop. 12% Ivysaur slaps forward with a vine. Good overall coverage in front of Ivysaur, though it has some slight startup. Deals diagonal knockback and can true combo into angled Vine Whip at low percents. It can also combo into itself at low percents, though this is not guaranteed. At mid percents, it can potentially chain into an up aerial. Due to its upward angle, it has difficulty KOing offstage, but can KO earlier if the enemy is close to the top blast line. Autocancels from a short hop. 3% (hit 1), 6% (hit 2) Ivysaur spins around vertically and hits behind itself with two vines, one after the other. The first hit is very weak and designed to combo into the second hit, which deals weak diagonal knockback. The first hit can start guaranteed combos once Ivysaur lands, though this may be difficult due to how fast the attack transitions. It has great horizontal range and low landing lag, making it well-suited for spacing. It can set up into itself and other moves, although this is not guaranteed. Additionally, it is very weak, and has significant difficulty KOing due to its angle. 15% Ivysaur shoots a burst of spores upwards from its bulb, which causes Ivysaur to move downwards slightly. If done near the peak of a full hop, Ivysaur will not experience much downwards momentum. A damaging move with a large hitbox above Ivysaur alongside powerful vertical knockback and little startup lag; it is one of the strongest up aerials in the game in terms of damage and knockback. Autocancels from a full hop, and has low landing lag, allowing it to be used in a short hop fast fall to challenge opponents on platforms. Despite its power, it deals low damage to shields. 10% Ivysaur turns upside-down and shoots a burst of spores downwards from its bulb, similarly to up aerial. Ivysaur's descent is stalled slightly when this move is used. Like up aerial, it is a powerful aerial, dealing decent knockback for a meteor smash, while having fast startup and an extremely large disjointed hitbox. The move has a sweetspot closer to the bulb that deals much more knockback, though the sourspot still meteor smashes. It is capable of hitting opponents easily out of a short hop, even from above platforms; at higher percents, it will cause grounded opponents to launch off the floor, allowing Ivysaur to punish missed techs and/or tech-chase with a multitude of moves, including any ground move or Bullet Seed. At even higher percents, up aerial will work as a KO combo at 130%, while up smash can act as a potent hard read from a wide range of percents. Its enormous hitbox allows it to hit most characters below the stage before they can even sweetspot the ledge. As a result, down aerial is one of Ivysaur's most useful aerial moves. — Ivysaur extends its vines forward to grab an opponent with them. Above average range, but has rather high ending lag for a standard grab. 1.3% Ivysaur headbutts the opponent while holding them with its vines. 5% (hits 1 & 2) Ivysaur holds the opponent in front of itself with its vines and headbutts them forward. The headbutt can affect bystanders. Has too much base knockback for combos and too little knockback growth to KO, hence its only use is to send opponents offstage. 12% Ivysaur swings the opponent with its vines while turning around, tossing them backwards. This causes Ivysaur to turn to face the other direction when it is used. Deals good diagonal knockback, being Ivysaur's most powerful throw in terms of damage and knockback, and KOs rather early at 109% near the edge of Final Destination. 4% (hit 1), 5% (hit 2) Ivysaur holds the opponent above itself with its vines and hits them with its bud, sending them upwards. Has combo potential at low percents, allowing combos into Bullet Seed or up aerial at 0%, or up aerial or Vine whip at around 30%. After 45%, it loses combo potential due to its knockback growth. 7% Ivysaur holds the opponent above itself with its vines and slams them into the ground while doing a frontflip. Ivysaur's best combo throw, which can start combos into up aerial or dash canceled up tilt at 0%. At around 60%, it can lead into Vine Whip, which can KO at around 83% if the sweetspot lands. 7% Ivysaur gets up with a horizontal spin, kicking to each side. 7% Ivysaur whips both sides with its vines as it gets up. 5% Ivysaur stands up and hits both sides with its vines. 9% Ivysaur climbs up and swipes a vine in front of itself. This is the fastest edge attack of the three Pokémon, coming out on frame 21 (as compared to Squirtle's frame 28 and Charizard's frame 24). Bullet Seed 3% (startup), 1.2-1.5% (seeds), 2% (contact), 3% (final seed) Ivysaur sends a barrage of seeds ascending from its bulb. Ivysaur will continue the move while the button is held, for up to 2 seconds. The seeds deal less damage the further they travel before hitting. There is a hitbox on Ivysaur's body and at its sides when the move is started, to launch opponents into the seeds, and there is also a hitbox on Ivysaur's body during the move, for the same purpose. The last seed Ivysaur fires deals greater knockback, to launch opponents away. The move has a maximum damage output of about 19.4%. Overall, the move is useful for deterring aerial approaches, or racking up damage through combos into it. Razor Leaf 8% (clean), 6% (mid), 4% (late) Ivysaur flings a single spinning leaf forward as a projectile, which can hit multiple opponents. The leaf has a random moderate curve to its trajectory, though this effect is significantly less noticeable than in Brawl. If the move is performed with a tap input, the leaf's distance and speed are increased. It deals low knockback, making it useful for setting up combos and even KO confirms with up aerial and Vine Whip. Vine Whip 11% (general), 13% (sweetspot) Ivysaur whips a vine diagonally upwards. The move functions as a tether recovery, and does not cause helplessness. The vine can be angled diagonally forward by holding the directional input forward, and will otherwise aim upwards. Ivysaur will gain a slight upwards boost when the move is used in the air, but only once until it grabs an edge or lands. As an attack, the vine has moderate knockback, but there is a sweetspot at the tip of the vine which deals powerful knockback. Some of Ivysaur's aerials and throws can lead into the sweetspot, allowing for strong combos. Pokémon Change The Pokémon Trainer calls Ivysaur back by throwing a Poké Ball at it, and then sends out Charizard. Triple Finish ~50% total The Pokémon Trainer sends out both Squirtle and Charizard, and all three Pokémon perform a combination attack involving powerful trapping attacks with long horizontal range. For Ivysaur's contribution to the attack, it uses Solar Beam, a long beam of energy that traps opponents for repeated damage. Pokémon Trainer releases Ivysaur from its Poké Ball while saying "Go!" or "Ivysaur!" Up taunt: Shakes from side to side, spinning its bud and leaves. Side taunt: Stands on its front legs and walks around while saying "Ivy, Ivy, Ivy." Ivysaur briefly falls over before the taunt ends. Down taunt: Extends its vines into the air and spins around in a dance, while saying "Saur, Ivy, Ivy." Steps from side to side. Looks around, then shakes its body. During Ivysaur's victory poses, the Pokémon Trainer says randomly either "You all did great!" (male)/"Everyone did great!" (female) or "Way to go, Ivysaur!" (がんばったな、フシギソウ！, while the female Trainer can say がんばったね、フシギソウ！, You did great, Ivysaur!). Pokémon Trainer pets Ivysaur, and it jumps on him, but Pokémon Trainer puts it back down and continues to pet it. During the opening cutscene, Ivysaur was sent out by Pokémon Trainer, along with Squirtle and Charizard, shortly before Galeem unleashed his beams of light. Under Pokémon Trainer's command, Ivysaur used Solar Beam in an attempt to fight the beams of light, but this attempt failed. Pokémon Trainer, Squirtle, Ivysaur and Charizard were all vaporized and placed under Galeem's imprisonment along with the other fighters, excluding Kirby. Ivysaur's Fighter Spirit can be obtained by completing Classic Mode. It is also available periodically for purchase in the shop for 500 coins. Unlocking Ivysaur in World of Light allows the player to preview the spirit below in the Spirit List under the name "???". As a Fighter Spirit, it cannot be used in Spirit Battles and is purely aesthetic. Each Fighter Spirit has an alternate version that replaces them with their artwork in Ultimate. Ivysaur in Pokémon Trainer's fighter card. With Squirtle, Charizard, and a Burrowing Snagret on The Great Cave Offensive. With Squirtle and Charizard on Skyworld. Attacking a Leaf Shielding Mega Man on Tortimer Island. With Squirtle and a giant golden Pikachu on Pokémon Stadium 2. Taunting with Sheik on Tomodachi Life. Taunting with Villager on 3D Land. Ivysaur is the only playable character in Ultimate whose up special is solely a tether recovery. Zero Suit Samus and Olimar each received new up specials in Super Smash Bros. 4, the Ice Climbers' Belay can function without a tether, and Joker's up special is a completely different move when using Arsene. With Vine Whip no longer causing it to experience helplessness, Ivysaur is now one of the few fighters in the game that is unable to put itself in a helpless state without touching a red trampoline from Pac-Jump.